This is an updated version of a post from 2012. 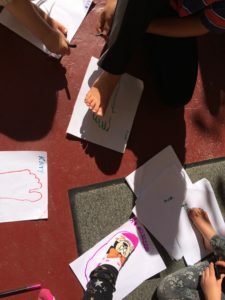 I created a “foot movement” lesson plan for my niece and nephew six years ago. When asked to teach some natural movement classes for our local school co-op this week, I couldn’t resist dragging it out and expanding it! 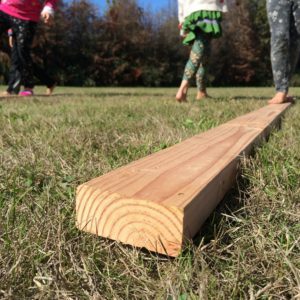 For those of you out there wanting to increase the movement opportunities for your home or family, or for those looking for movement or movement science homeschool lessons, this post is for you. This foot unit gets kids out of their shoes and into their feet. 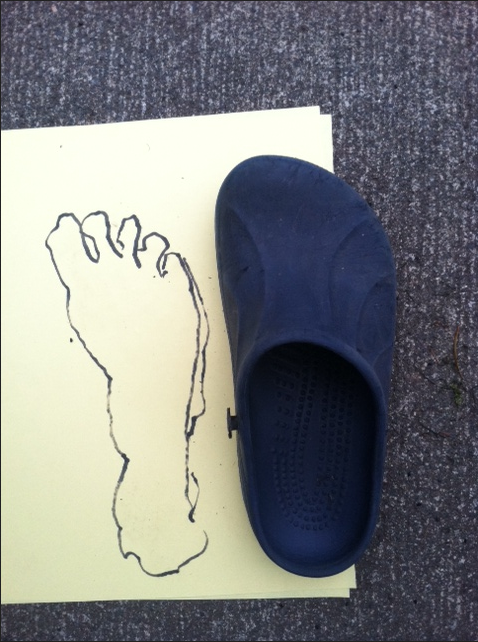 Start the unit by having them trace their foot (or, having their foot traced). I used to start with foot writing, but found out that "everyone, take off your shoes" became an unnecessary instruction (aka less work for me) when I started with "everyone, trace your foot." I'm lazy, it's true. 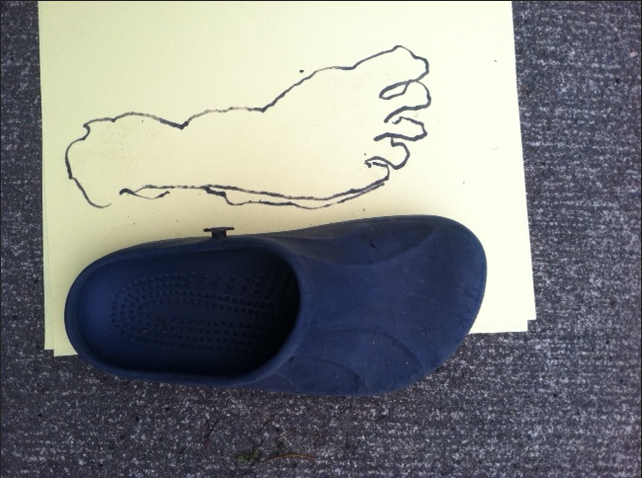 Then, have them compare their shoes to see how their shoes measure up to their foot tracing. 1. How does your foot-shape compare to your shoe shape? 2. How do you think this affects your feet? One issue kids have with their shoes is outgrowing them before a parent realizes it. Many adults have reported developing the habit of scrunching their toes, just a little, to keep them from touching the end of their shoes. When we get used to scrunching our toes in our shoes, when we start buying shoes as adults that give us this same scrunchy (too technical?) feeling. This exercise is a nice way to see how our shoe and feet shape compare. Shopping tip: Pick shoes that have enough space for your (and their) toes to spread out and away from each other. For more information on how to shoe shop for kids, read Back To School Minimal Shoe Shopping. For older kids, have them fold their piece of paper to mark the top half (for handwriting) from the bottom half (for foot-writing). And for tons of fun, try it with the OTHER foot. And in cursive. And then writing backwards. And in reverse. Maybe not that last one. Have them compare their hand to foot writing and see if they get better with practice! For this class, I didn't insist on bare feet. I had kids wanting to stay in their shoes and wanting to stay in their socks, and that's just fine. I know sometimes I have my reasons and I assume that kids have their reasons too. 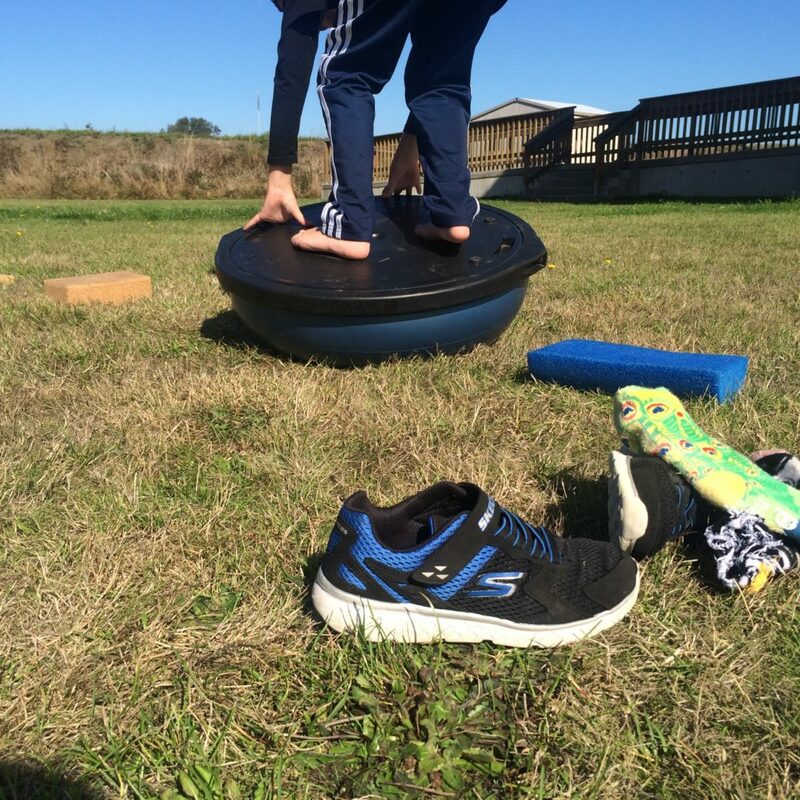 What I did do was set out some items to stand on—blocks, half foam rollers, a BOSU, and a rock—and started standing on them with one foot, counting loudly to ten. Once everyone wanted to try, I had them count how long they could hold it on one foot, then the other, with their arms out, with them down, and with their eyes closed. They tried all the shapes to see how each shape moved them. After that, I laid out a few 2X4s. Did I have them walk on it? No. I started walking on it, which pretty had everyone push me off so they could do it themselves. I suspect that something like "Children, please come here and do this walking down the balance beam lesson" would only make me seem uncool, so I went with their natural biological tendency to mimic those older than them. For some walking the beam was easy and for some it was challenging. 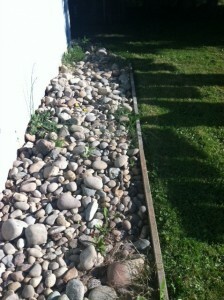 I could quickly keep everyone challenged by adding things like "close your eyes", "hold this rock", or blindfold them. Then I had them walk sideways, which is like getting a brand new body that's never balanced before. 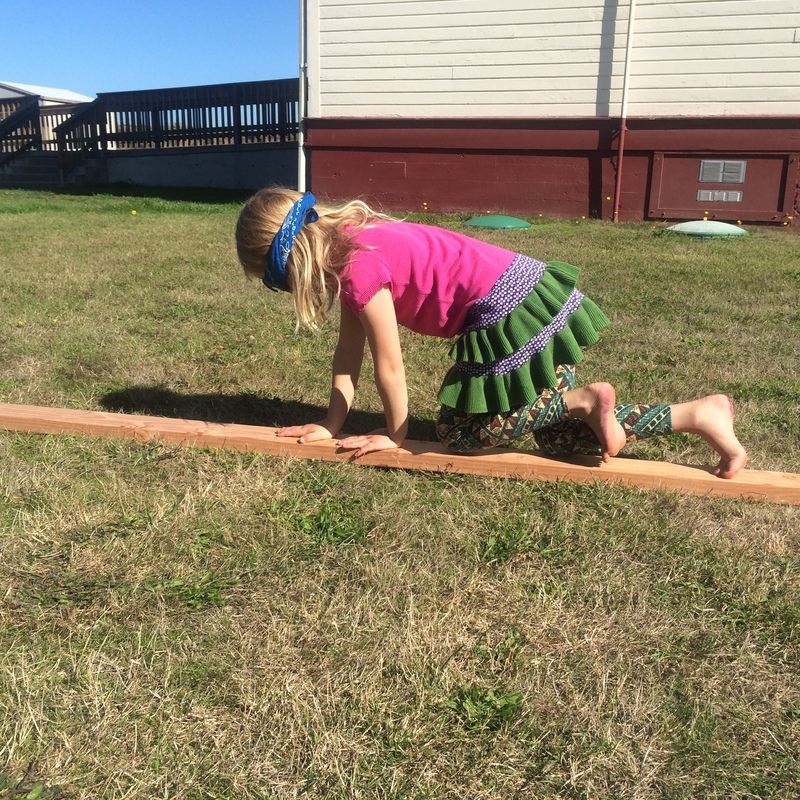 Then, I mixed the items I had them balance at the beginning with the 2x4s fashioning a simple obstacle course. THIS IS WHERE THE MAGIC HAPPENED, FRIENDS. Balance is tricky and it really does utilize the "ground ears" we stuff into our shoes each day. 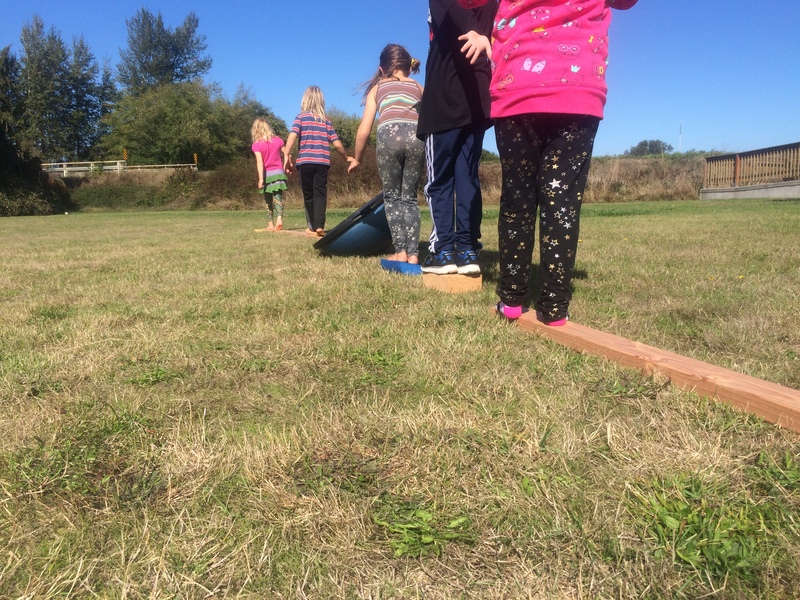 Once we introduced complex movement (things round and wobbly beneath their feet), the kids not navigating the course successfully were getting frustrated. "You know, I've found that I balance better when I can use all the muscles in my feet," I said slyly. THE SHOES AND SOCKS WERE WHIPPED OFF and everyone's balance improved. Then I had them crawl it (showing them how to tuck their toes and have 10 extra tiny hands to help them hold on), and then crawl it blindfolded if they wanted even more movement. 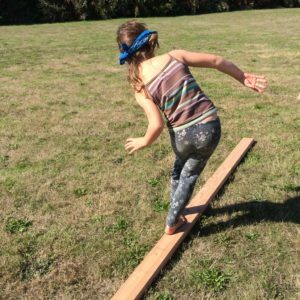 There were smiles, and laughs of accomplishment, and THEN MORE MAGIC HAPPENED, which is just what Barefoot and Balanced author Angela Hanscom and I talked about on my podcast in the episode about kids and more movement: they built their own obstacle course, more complex than the one I had set up, and started leading their own movement. We started by sitting down and tracing our feet and ended up getting to whole-body, self-led play in an hour. They also ended up making a catapult that launched yoga blocks across the the yard when you jumped onto one end, so really, we went from feet to whole-body physics. Fewer things have thrilled me more. For older kids who want to add on some more anatomy/smaller movements: introduce the idea of nerves in the feet. Lift their big toe by itself. Lift each other toe by itself. Spread the toes away from each other. Spread the toes away from each other without lifting them off the ground at the same time. Test the sensory nerves: Sensory nerves measure environmental factors like temperature and surface textures. Collect items from around the house with various texture, like a washcloth, sandpaper, a toothbrush (of some unlucky person), some pebbles of various sizes, a set of silverware (to be washed before putting back, especially if you have me over for dinner), an ice cube and something warm. You'll also need a blindfold. See how many items you can all can identify by touching items with only their feet! This simple game opens our mind to the idea that our feet are constantly taking in data in the same way our eyes take in information. Can they tell temperature with their feet? 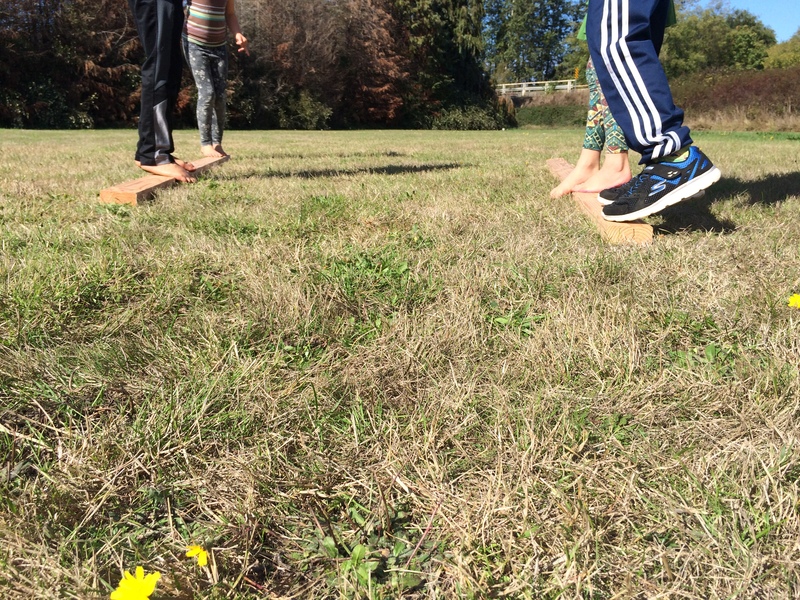 Can they tell the difference between a patch of dirt, or grass, or bricks—just with their feet? YES, they can! To discuss: To keep the nerves healthy and alert, we can expose our feet to various surfaces and items like rocks, dirt, grass, and soft pine cones (vs. forks, knives, and shards of glass). Many people expose their feet ONLY to the sensation of socks, the same pair of shoes, and the flat surfaces inside their home. How can we remedy this? 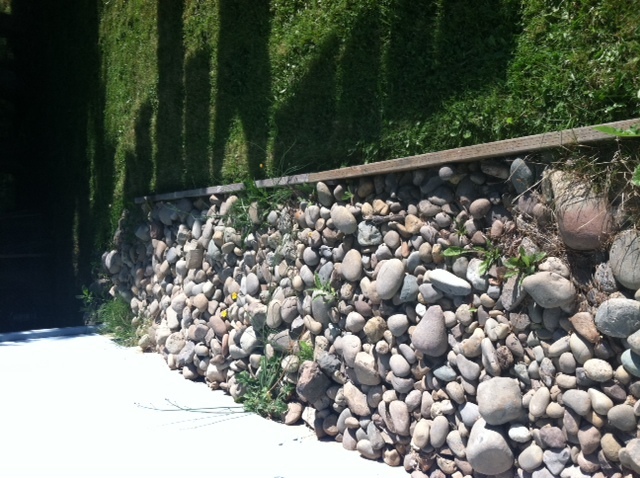 Create an indoor texture box or a clean space in your yard for texture walking. Too much work? Too cold and snowy where you live? A cobblestone mat works too! Or, if you want more foot stuff, check out my books Simple Steps to Foot Pain Relief and Whole Body Barefoot. P.S. I head rumor I have a kids' book coming out next fall. I mean, I'm spreading the rumor right now. I heard that's happening, so. There you go.